SEOUL, South Korea North Korea vowed Tuesday to restart a nuclear reactor that can make one bomb's worth of plutonium a year, escalating tensions already raised by near daily warlike threats against the United States and South Korea. The North's plutonium reactor was shut down and partially destroyed in 2007 as part of international nuclear disarmament talks that have since stalled. The declaration of a resumption of plutonium production  the most common fuel in nuclear weapons  and other facilities at the main Yongbyon (also spelled Nyongbyon) nuclear complex would boost fears in Washington and among its allies about North Korea's timetable for building a nuclear-tipped missile that can reach the United States, technology it is not currently believed to have. A spokesman for the North's General Department of Atomic Energy said that scientists will begin work at a uranium enrichment plant and a graphite-moderated 5 megawatt reactor, which generates spent fuel rods laced with plutonium and is the core of the Yongbyon nuclear complex. The U.S. called the announcement "extremely alarming." The White House and the State Department said they were taking seriously an almost daily string of threats from North Korea toward the U.S. and South Korea, but officials cast doubt on whether North Korea would follow through, portraying the latest threat as part of a pattern of antagonistic taunts that, so far, have not been backed up by action. That evidence, said Fitzpatrick, would likely come in the form of fresh satellite imagery showing work to restore a cooling system at the reactor. The cooling tower for the reactor was destroyed as part of a deal reached in the disarmament talks in 2007. According to Fitzpatrick, if the North Koreans have actively maintained the decommissioned facility since it was last visited by a Western scientist in 2010, then they could potentially get a new cooling system up and running within six months, and that activity would be spotted by satellites. Fitzpatrick notes, however, that even the claim by North Korea that the facility will be restarted to enrich uranium and to produce plutonium for weapons represents, "a serious escalation to the threat that they pose." Tuesday's announcement, said Fitzpatrick, is the first time the North Koreans have openly linked their uranium enrichment program to their weapons program. Satellite imagery released in the spring and summer of 2012 showed new construction work taking place at the Yongbyon plant, including images which showed a new dome roof installed atop a separate, light-water reactor building. Analyst Allison Puccioni at IHS Jane's Defence Weekly said in a statement in August 2012 that an image taken by satellite earlier that month showed a new dome roof had been hoisted atop the reactor. The unidentified spokesman for the North's atomic energy agency said Tuesday the move to bring the facility back online was part of efforts to resolve the country's acute electricity shortage but also for "bolstering up the nuclear armed force both in quality and quantity," according to a statement carried by the official Korean Central News Agency. He did not give a timetable for the resumption of work at Yongbyon. CBS News correspondent David Martin reports that a U.S. Navy missile defense ship has also been stationed southwest of the Korean Peninsula, and a sea-going radar could soon be moved into position to keep close watch on North Korea's launch site for long-range missiles. Reuters reported that the USS McCain, an Aegis-class guided-missile destroyer, was the ship sitting off South Korea's coast. The White House said Monday, however, that despite the bellicose rhetoric from North Korea, the Obama administration has not seen any significant changes in the regime's military posture. White House press secretary Jay Carney said no military mobilization or repositioning of forces from Pyongyang to back up the threats had been detected. The threats are seen, rather, primarily as efforts to force policy changes in Seoul and Washington and increase domestic loyalty to young North Korean leader Kim Jong Un by portraying him as a powerful military force. Nonetheless, the war rhetoric has reached new levels in the past weeks -- sufficient, reported CBS News foreign affairs analyst Pamela Falk, to prompt United Nations Secretary-Ban Ki-moon to warn in a statement and a tweet from the tiny European nation of Andorra that the crisis "has already gone too far." "Nuclear threats are not a game," Ban said. "Aggressive rhetoric and military posturing only result in counter-actions, and fuel fear and instability. Things must begin to calm down, as this situation, made worse by the lack of communication, could lead down a path that nobody should want to follow." North Korea added the 5-megawatt, graphite-moderated reactor to its nuclear complex at Yongbyon in 1986 after seven years of construction. The country began building a 50-megawatt and a 200 megawatt reactor in 1984, but construction was suspended under a 1994 nuclear deal with Washington. 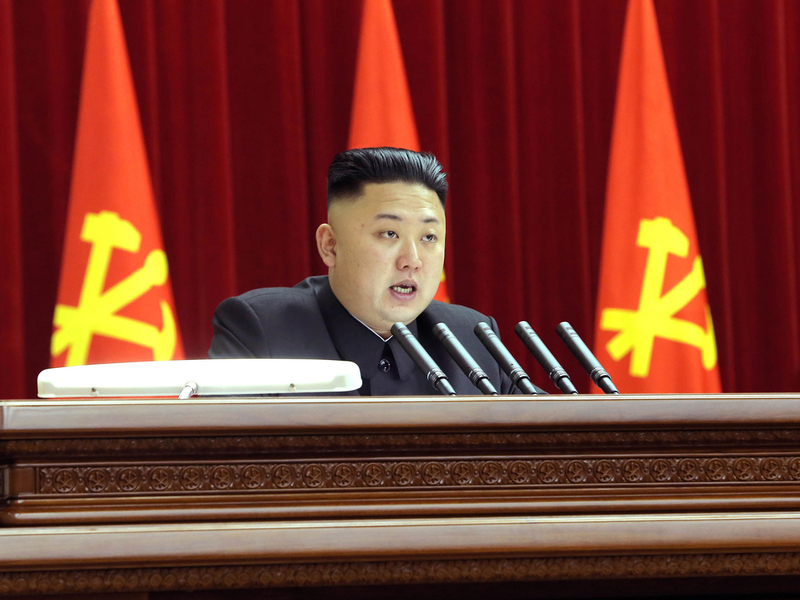 North Korea says the facility is aimed at generating electricity. It takes about 8,000 fuel rods to run the reactor. Reprocessing the spent fuel rods after a year of reactor operation could yield about 7 kilograms of plutonium  enough to make at least one nuclear bomb, experts say. Scientist and nuclear expert Siegfried Hecker has estimated that Pyongyang has 24 to 42 kilograms of plutonium  enough for perhaps four to eight rudimentary bombs similar to the plutonium weapon used on Nagasaki in World War II.